The Plate-billed Mountain-toucans (Andigena laminirostris) - also known as Laminated Hill-Toucans or Laminated Mountain-Toucans - occur naturally in the humid forests on the west Andean slopes in north-western Ecuador and south-western Colombia. While they remain fairly common locally, their numbers have declined due to habitat loss. The Plate-billed Mountain-toucans occur in the western Andes from southwestern Colombia (Patia Canyon, in Nariño) south to southern Ecuador. Their range may stretch as far south as the Chanchan River. They inhabit humid Montane forests where bromeliads, cecropia and mosses are abundant; at elevations between 1,188.72 and 3,200.4 meters (3,900 and 10,500 feet). At this point in time, they are said to be 'fairly common' within their range; however, a moderately rapid and on-going population decline due to habitat loss and destruction has been noted, and they are now classified as "Near Threatened" by the IUCN. The principal threads to their existence are habitat loss due to intensive logging, human settlement, cattle grazing and mining. Another factor is the international cage bird trade. Plate-Billed Mountain Toucans measure 16.5 - 21 inches in length. The bill alone is about 3.25 - 4 inches (8 - 10 cm) long. Males are slightly larger, weighing on average 11.1 oz (314.68 g); compared to the average female weight of 10.7 oz (303.34 g). The large bill is extremely light in weight. The extreme base of the upper bill and half of the lower bill is a dark red. The bony, raised, rectangular plate portion, near the base of the upper bill, is ivory in color. The remaining parts of the bill are black. The crown and nape are glossy black. The upper plumage and wings are a golden olive color. The wing feathers are a darker green/brown. The rump (lower back) is a lemon yellow. The upper tail-coverts are dark green. The plumage below is brilliant blue with a patch of bright yellow patch at each side. The thighs are a maroon-like brown with red under tail-coverts. The grey tail feathers are highlighted with a little rufous at the tips. They have bright red irises. The eyes are surrounded by bare yellow skin, with a yellow-green patch above it. Juveniles: Immature birds have typically a softer and duller plumage than adults. The Plate-billed Mountain Toucan resembles the Black-billed Mountain Toucan, but the latter can be identified by the uniformly colored bill (black in the nominate race and chestnut-blackish in the subspecies) and the white throat. 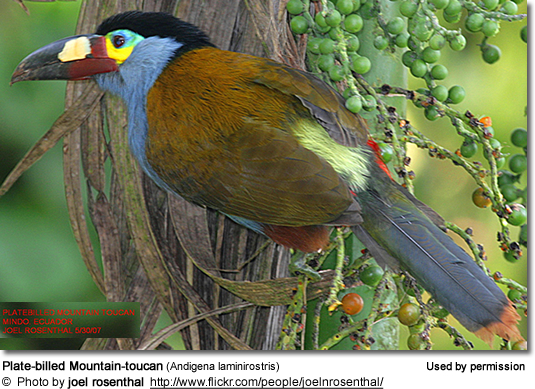 The Grey-breasted Mountain Toucan is grey on the front and the rest of the plumage is not as brightly colored as the Plate-billed. The Hooded Mountain Toucan has a darker hood on the top of its head and lacks the bright colorations around the eyes. Most of the breeding activities are recorded between June and July when fruits (their primary food source) are most abundant. They reach reproductive age when they are about 3 years old. They form monogamous mating pairs. As part of the courtship ritual, males will feed fruits to the female and mutual preening occurs. Pairs will call each other in duets. The males make loud repetitions of tryyyyyyyk and the females emit drier t't't't't't't't calls. Like all of their other activities, nesting happens high up in hollow areas in trees.The bill is not effective for digging or any other type of extensive excavation work and so they must rely on holes already formed by other means. Therefore, they typically invade woodpecker holes. The nests are not lined, but the three to four shiny white eggs that are laid each year rest on a few wood chips created while enlarging the opening or on various kinds of regurgitated seeds collected for this purpose. Parents share equally in incubation duties which lasts about 16 days. However, the parents rarely sit on the nest for more than an hour at a time and the eggs are often left uncovered. Both parents feed fruits to the babies for up to 8 weeks. The nestlings are born blind, with no trace of down on their pink skin. The bill is unremarkable until about 16 days old when it takes on the distinguishing features of the toucan, and requires up to four months to develop fully. Feathers begin to expand at 4 weeks. Babies have pads on their elbows that protect their feet by keeping them elevated until they fledge. The young fledge from the nest between 46 and 60 days old. The Plate-Billed Mountain Toucans are the most vocal of all of the Mountain Toucans. Their vocalizations include loud rattles and clicks that can be heard from 1 kilometer or more away.